Master the unique, multi-faceted role of the Canadian nurse. Confidently embark on a lifelong learning journey and prepare for the daily realities of Canadian nursing practice this with comprehensive, Canadian-focused text. 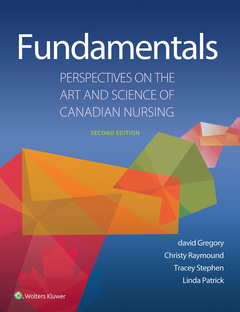 Developed specifically for your needs by talented Canadian students, practicing nurses, scholars, and educators, Fundamentals: Perspectives on the Art and Science of Canadian Nursing, 2nd Edition, delivers an integrated understanding of nursing fundamentals through a continuum that guides you from one chapter to the next and from learning to understanding. New! Inter-Professional Practice helps you achieve positive patient outcomes through effective collaboration with the healthcare team. New! Diversity Considerations alert you to important patient care considerations related to culture, sexuality, gender, economics, visible minorities, and religious beliefs. New! NCLEX®-style questions at the end of each chapter test your retention and ready you for success on your exams. Revised! Skills chapters familiarize you with a wide variety of advanced skills to broaden your clinical capabilities. Enhanced focus on LGBTQ-related considerations, demographic shifts in Canadian society, end-of-life/palliative care, substance abuse crises, and refugee communities helps you ensure confident care across diverse Canadian populations. Case Studies place chapter content in a realistic context for the most practical understanding. Think Boxes encourage critical thinking and challenge you to apply your knowledge to different situations. Through the Eyes features familiarize you with patients’ perspectives to help you provide thoughtful and effective care interventions. Research equips you with the latest and most relevant Canadian healthcare findings based on clinical evidence. Critical Thinking Case Scenarios strengthen your clinical focus and critical thinking through real-life situations.